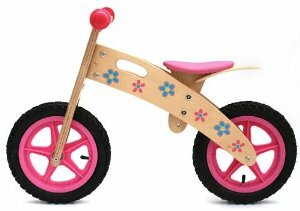 The Oowee Pink Balance bike is another funky and fun bike from Kidzmotion, who also manufacture the Jiggy Wooden Balance Bike, which we featured recently on this website. The Oowee Pink Balance bike is priced at £44.99, and it is definitely one for the girls in the family, with the wheels and saddle a striking pink, which complements the flower petal design on the frame. This is one of our favourite pink balance bikes! Manufactured from birch plywood, the wooden frame is environmentally friendly and the bike is easy to manoeuvre which is one of the main advantages of wooden balance bikes. Other features include safety handlebars which have a soft grip on either end, a soft padded seat and a saddle height which can be adjusted between three heights of 38cm, 40cm and 42cm. This means that the bike will probably be too big if you are looking for a bike for a 2 year old, as these bikes will start with saddle heights starting at 28cm or 29cm. Check out our guide to balance bike saddle heights and our recommendations for the best balance bike for 2 year olds. This is a fun bike that your kids are sure to love, and the Oowee Pink Balance bike also features a carry handle and air tyres. This gives the advantage of a more comfortable ride with plenty of ‘give’ as the rider goes over bumps and up and down kerbs. Read our guide to balance bike tyres. The bike does require some assembly this is really straightforward so your child should soon be off and on their bike. Although it does not boast some of the features of the more expensive bikes available – the Oowee Pink Balance bike is a great way to learn to ride and is ideal for outings to the park this year!